My son is getting married in April and the preparations have begun. In a few days I am off to India to shop till I drop! Easy to say that but am pretty tensed as I have so many things to do. In spite of writing all the ‘to do’ things on a list I am just worried that I may forget something. Its at times like this, one does not want to make a mistake in case you hurt someone’s feelings. When I got married, all the preparations and decisions right from the guest list to my wardrobe was decided by my parents and family. These days things are different and the bride and groom have a big role to play in the preparation and decisions. It is not easy with family being far and wide but I really thank God that we have emails, whatsapp,sms, easy phone call facilities etc. Family members from India, Canada, UK, Dubai and France stay connected and plan the wedding. I made these coconut chocolates to give out with the invitations where ever possible. Most of the invites were for abroad but a couple were for Mombasa. Make these easy chocolates for special occasions, as gifts or just to satisfy your sweet tooth. I usually make these for Diwali to offer to guests when they come home. Sieve the milk powder and icing sugar into a big bowl. Add essence to the milk and mix. Add to the coconut mixture and form a dough. Take about ½ tsp of the filling and roll into a ball. Sieve the icing sugar, milk powder,cocoa powder and drinking chocolate into a bowl. Add the lemon juice and milk and form into a dough. Divide the dough into parts according to the number of coconut balls you have made. Grease your hands a bit and press one part of the filling dough into a small circle. 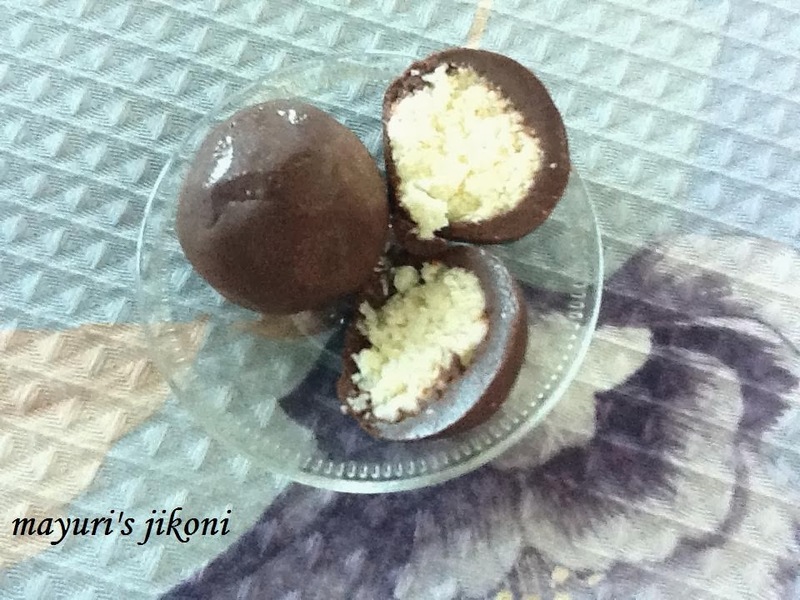 Place the coconut ball on top of the coating mixture. Cover the coconut ball completely with the coating. Roll gently to make a smooth ball. Repeat steps 2 to 5 with the remaining filling and coating. Put in the fridge if you stay in a hot and humid place. Add essence or extract of your choice. Add more milk to the coating if the dough cracks while rolling. The chocolate keeps well for a month in the fridge. Wow .. Fudge with coconuts .. Different combo .. Thank you for linking it to m event . Oh yummy coconut chocolate .Advanced Congratulatons for ur son and daughter-in-law.